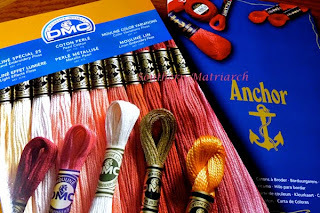 I have some new tools for my embroidery/smocking toolbox. 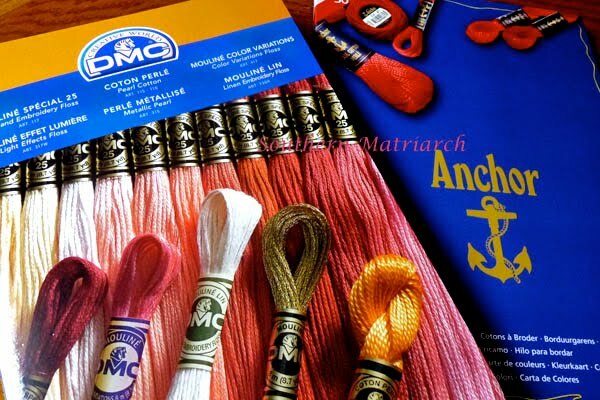 Thread charts for both DMC and Anchor flosses. I had always wanted one and when I saw Michie' Mooney post about the DMC chart on her blog, I took the plunge. I purchased the DMC chart first. When it came, I liked it so much, used it right away and declared right then I had to have the Anchor as well. They are a bit pricey I guess, but so worth it in my opinion. I purchased the DMC card directly from them, but the Anchor card I could only find from a vendor on ebay. I paid about $25 for the DMC card and about $35 for the Anchor one. Again a bit pricey, but very worth it. 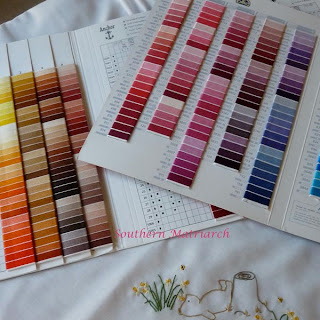 I can not tell you the number of times I have dug through my floss boxes, pulling out a half dozen or so at a time, trying to match colors to fabric. Above is how I store my floss. 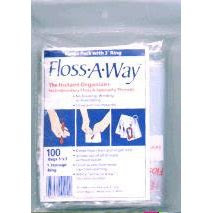 In Floss Away bags. 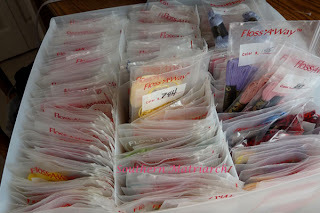 I started using these bags about 26 years ago, when I took my first smocking class at the Heirloom Shop in Pensacola FL. At the time, one of the few ways I had seen to store floss was by winding it on those bobbins. This wasn't going to work. 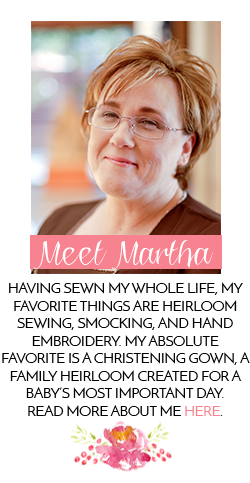 First I had three tiny children, this process had disaster written all over it. Plus I didn't want my floss to have those kinks in it. Floss Away used to have storage boxes as well. Well I filled those two buddies up in a hurry. 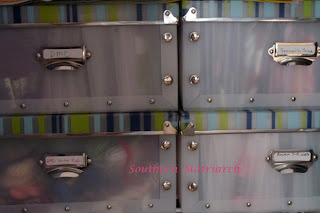 When I could no longer stuff another single floss bag into the boxes I had, I found these scrapbooking storage boxes at Oriental Trading. The boxes measure 11 1/8" x 5 1/4" x 12 1/2", and come with dividers. 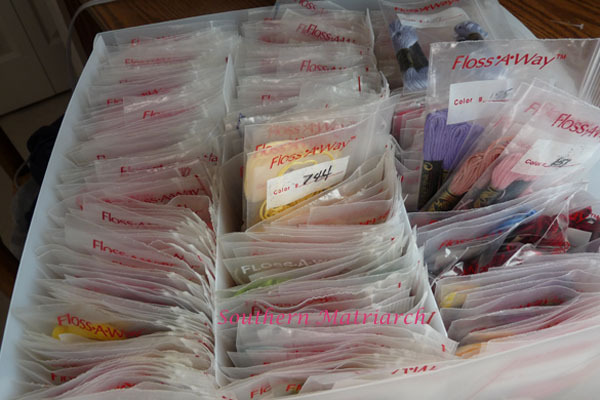 I am able to get three rows of floss bags into each box. I have four of them, each of them labeled with the kind of floss. I haven't done the box that has the DMC Broder Medici yet. And that shot is as close as you are getting to the inside of my stash closet. I don't tell everything I know. I hope you are stitching on something beautiful. Great idea! Thank you! I want those charts now. Now...back to smocking Tinkerbell for me. Thanks guys. Everyone has their own system and this one works for me. Goosegirl, Tinkerbell, how cute will that be! Very nice organizations tools. 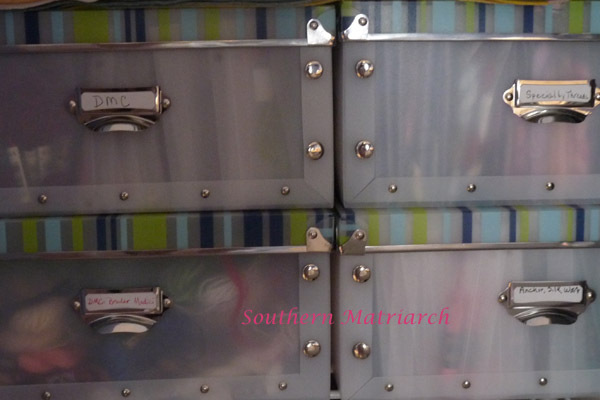 I need to have my whole life organized!